On 14 September we open our new BP exhibition Scythians: warriors of ancient Siberia, which is organised with the State Hermitage Museum in St Petersburg, Russia. This marks an important moment in the long-term relationship between two of the world’s oldest, largest and most encyclopaedic museums. 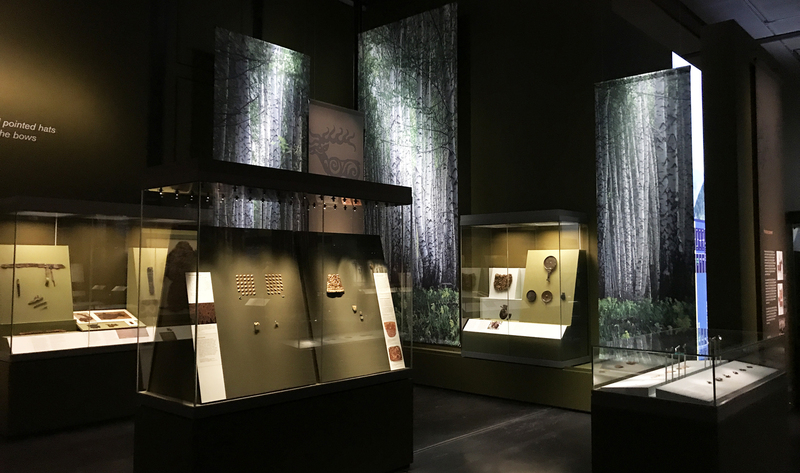 Our exhibition is a tribute to Russian discoveries and research that began in the reign of Peter the Great and Russia’s first museum, the Kunstkamera, and has continued with archaeological discoveries and new research up to today. It is the culmination of this year’s celebration of Russian art and culture in the UK. The idea behind this exhibition began early in 2014. Internal discussions followed, and once it was agreed the proper work could begin. 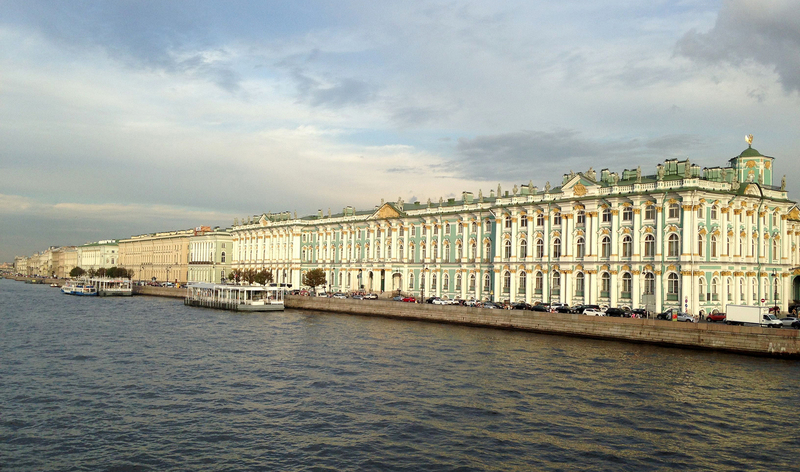 There was an exchange of letters between our directors, followed by curatorial correspondence, and I finally flew to St Petersburg in September 2015 to begin discussions in person. It was a glorious autumn. 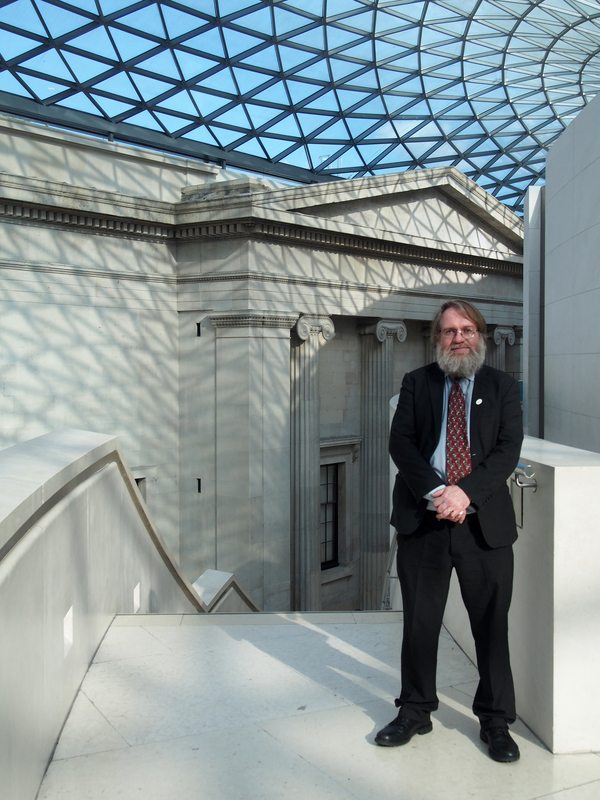 I had been there before and have worked for many years in Central Asia with curators from the Hermitage and archaeologists from the neighbouring Institute for the History of Material Culture. I met the staff of the Hermitage’s Department of Archaeology of Eastern Europe and Siberia, including Dr Svetlana Pankova, their lead curator on the project. It has been an absolute delight to work with her and all her colleagues there and in other departments, from Classical Antiquities and History of Russian Culture to Conservation. During that visit we looked at some of the wonderful Scythian gold objects from Peter the Great’s Siberian collection which are on display in the Hermitage’s Treasury, equally spectacular finds from frozen tombs at Pazyryk in the high Altai mountains, and other objects from their Black Sea displays. We also visited storage areas and started to draw up a wish list of objects. These included early lumps of cheese and whole sheepskin found in frozen tombs at Pazyryk, and the largest wooden Scythian shield ever found. Lengthy discussions then followed by email as the object list was refined, pieces sent for conservation and extensive new photography undertaken. St John Simpson in the Great Court. In November 2016 I returned to St Petersburg with two colleagues from our Department of Scientific Research. We were aiming to confirm the object selection, meet their scientists and see their laboratories, and come back with answers for a whole range of queries about the loan, including conservation, display, scientific research, publication and copyright. Winter came early that year, so the city looked very different – very few tourists, but blanketed in snow with ice-breakers working in tandem along the River Neva immediately outside the Hermitage’s windows. 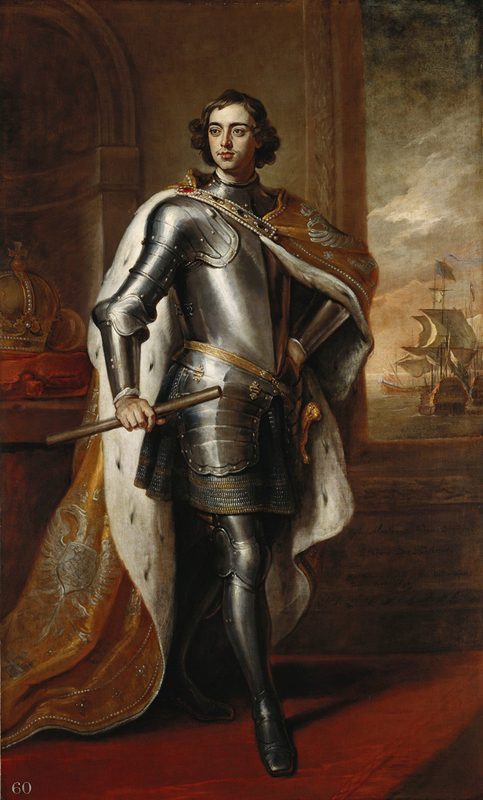 Sir Godfrey Kneller (1646–1723), Peter the Great, Tsar and Grand Duke of Muscovy. Oil on canvas, 1698. Royal Collection. © Her Majesty Queen Elizabeth II, 2017. Other loans were successfully negotiated over this period too. These included important objects from the National Museum of the Republic of Kazakhstan, which will be seen in the UK for the first time, plus tomb groups from the Ashmolean Museum in Oxford, and a magnificent portrait of Peter the Great lent by Her Majesty The Queen from the Royal Collection. 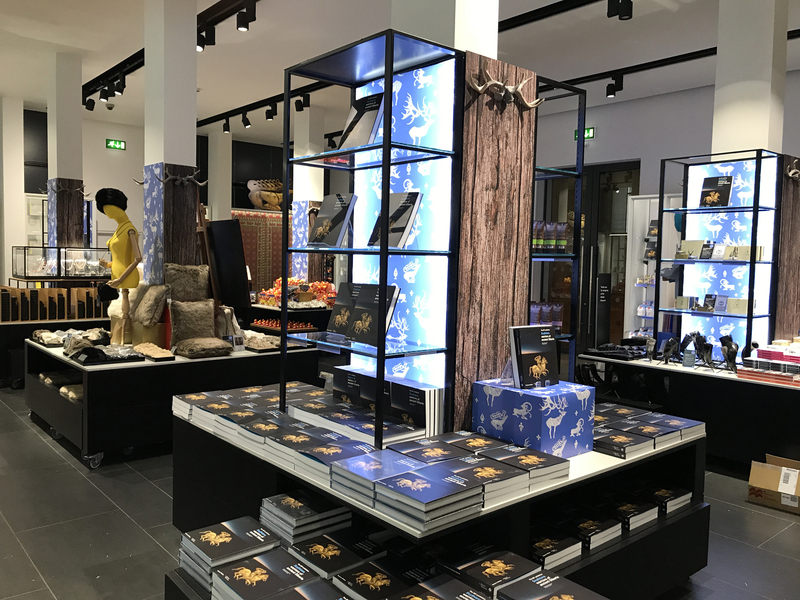 The catalogue is available in the exhibition shop. Many new images also started to flood in and my colleague Project Curator Chloe Leighton kept on top of all of these, and managed the due diligence process and master object list. We also had panel and label text to write, along with blogs and other social media posts. With other staff, we recorded interviews, wrote articles for magazines, planned events, decided on shop products, designed posters and adverts, and covered all the other myriad aspects which go into making an exhibition. Although some people think this is quite stressful, I try not to let it get to me. I find it’s actually all about prioritising and answering as quickly as possible, and fortunately all our colleagues are very sympathetic, and know exactly what it’s like through experience. Project Curator Chloe Leighton with one of the loan objects at the press launch. On 30 May 2017 we held our press launch at the Museum, and this saw the beginning of the marketing campaign, with the first banners and posters going up on site. Since then, the Scythians have slowly made their way into people’s consciousness through press articles in the Guardian, The Times (£) and even a Game of Thrones piece in the Telegraph. A month later I returned to the Hermitage as part of a press trip where the invited journalists were able to interview the Director, Dr Piotrovsky, and see some of the objects as they were being packed to come to London. 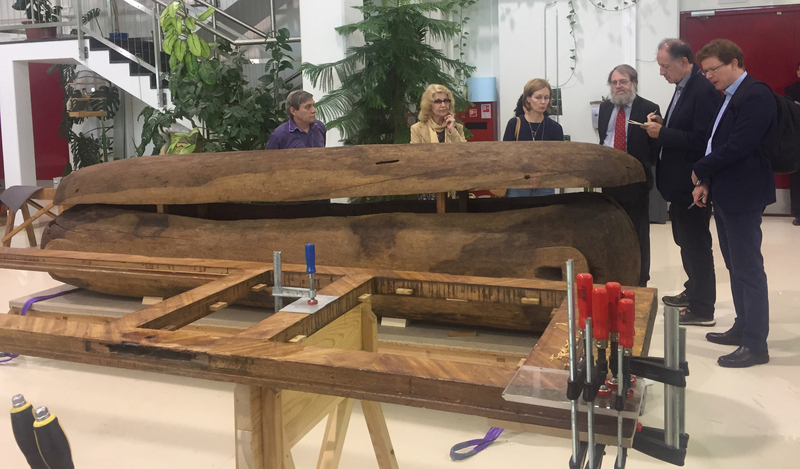 Hermitage curator Dr Pankova explains the significance of the log coffin during the press trip. The objects started to arrive with their couriers in early August and then the careful process began of unpacking, condition checking, mount making and tweaking the designs to show the objects to best effect. 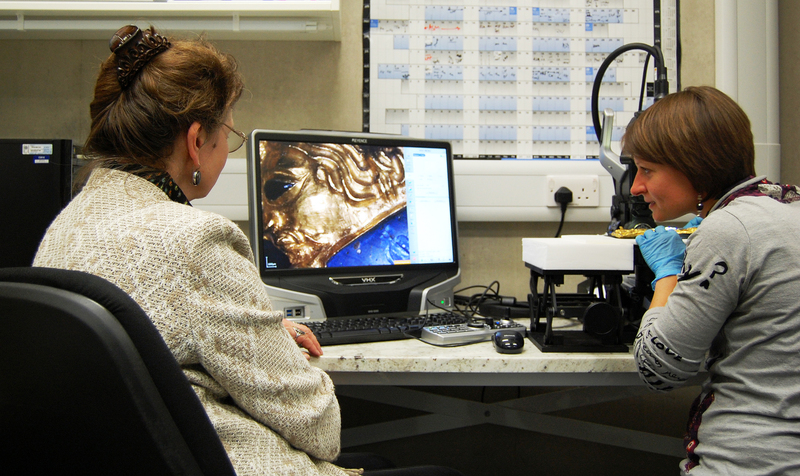 British Museum and State Hermitage staff undertaking scientific research on some of the gold objects from the State Hermitage Museum. 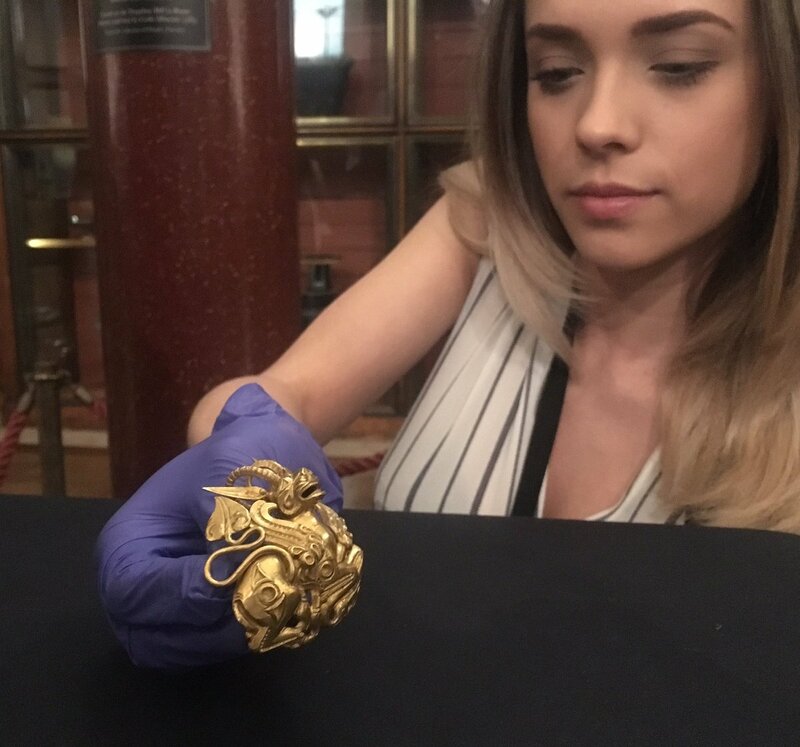 This was also a great opportunity to answer some questions we had about techniques used to make some of the objects – particularly gold objects from Peter the Great’s collection – and this analysis was carried out by our Department of Scientific Research. We were very privileged to be allowed to do this – some of the new results have been incorporated into the exhibition and will be discussed in greater detail at our conference in October. 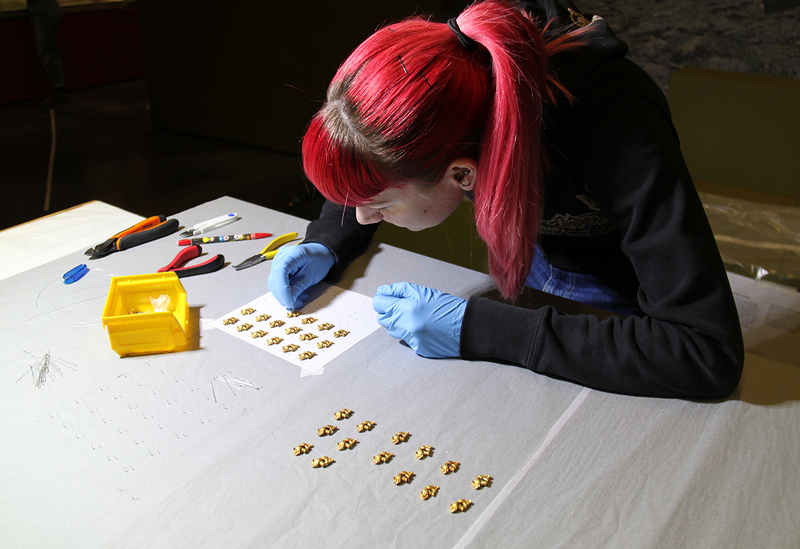 Pinning gold lions during the exhibition installation. The installation phase went very smoothly, thanks mainly to the superb collections management team and conservators, and there was quite an emotional farewell when all the couriers left at the end. 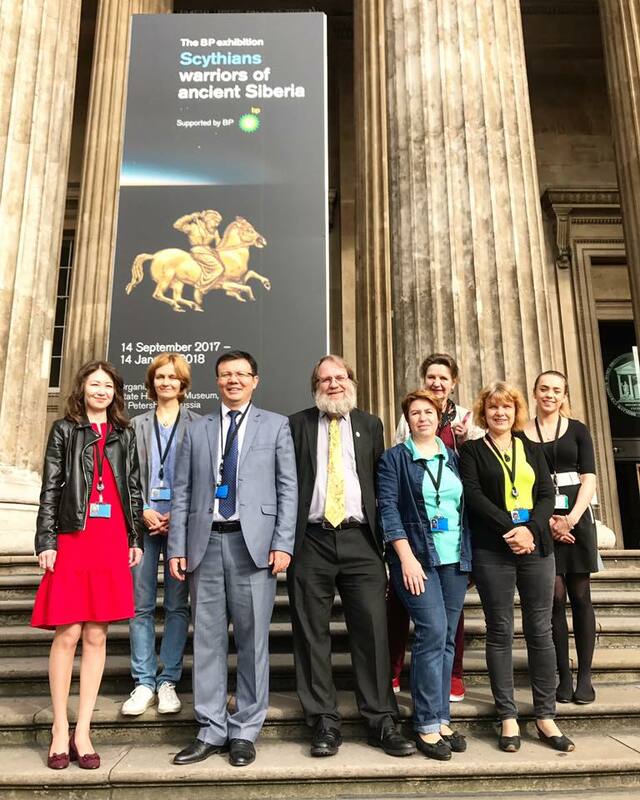 State Hermitage Museum and National Museum of the Republic of Kazakhstan couriers on their last day at the British Museum. Left to right: Kunikey Sakhiyeva, Svetlana Pankova, Abay Satubaldin, St John Simpson, Marina Michri, Elena Korolkova, Elena Stepanova, Chloe Leighton. The years have flown past. The Museum’s special exhibitions are a unique opportunity to take an idea and show objects in new ways and different combinations. They are experiments shaped by curatorial knowledge, the experience of designers, the flair of interpretation, and our knowledge of our audiences and their expectations. I ask you to please come and see it for yourself and very much hope that you enjoy what you see.